Walnuts activate a part of the brain known as the right insula and increase the activity, which helps in decreasing the hunger and cravings of an individual. Type 2 diabetes risk among those who consume walnuts can be lowered by 47 percent, especially in those who ate about 3 tablespoons of walnuts. Including nuts in your every day diet can improve health. 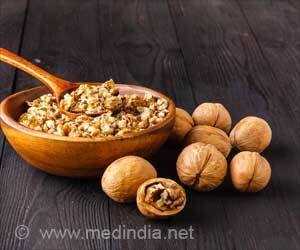 Here are some nutritious recipes with the goodness of almonds and walnuts.